YouTube Says It Wrongly Blocked Some LGBT Videos In "Restricted Mode"
The video site's "restricted mode" aims to filter sensitive content, but several LGBT vloggers and artists say it went too far. YouTube apologized on Monday and vowed to fix a filtering feature that several prominent LGBT creators said censored their videos. The site's "restricted mode" lets users filter out "potentially objectionable content," the platform says, but some vloggers said it's actually hiding pro-LGBT material by marking it as inappropriate. Videos ranging from a documentary about trans youth, to makeup lessons and an LGBT couple reciting wedding vows were no longer visible after the filter was enacted. Pressured by the backlash, YouTube apologized on Monday and conceded that the filtering mechanism had mistakenly removed content, misunderstanding context and nuances. "The bottom line is that this feature isn’t working the way it should. We’re sorry and we’re going to fix it," the company wrote in a blog post. The company first responded to users' criticism on Sunday night, explaining that the filter's intention was to remove mature content for a select user group, but it did not give any details as to why and how such material was categorized as inappropriate. Tyler Oakley, a YouTube star with 8 million subscribers, said the platform blocked a video about people who inspired him. Singers Tegan and Sara had a similar experience, tweeting that a slew of their music videos had disappeared in restricted mode. Rowan Ellis, who makes videos about pop culture from a feminist and queer perspective, flagged the issue in a video on Thursday. She told Gizmodo that the filtering reinforces "a bias somewhere within that process equating LGBTQ+ with 'not family friendly.'" Her video criticizing the platform is one of among 40 others that were blocked by the filter, she said. 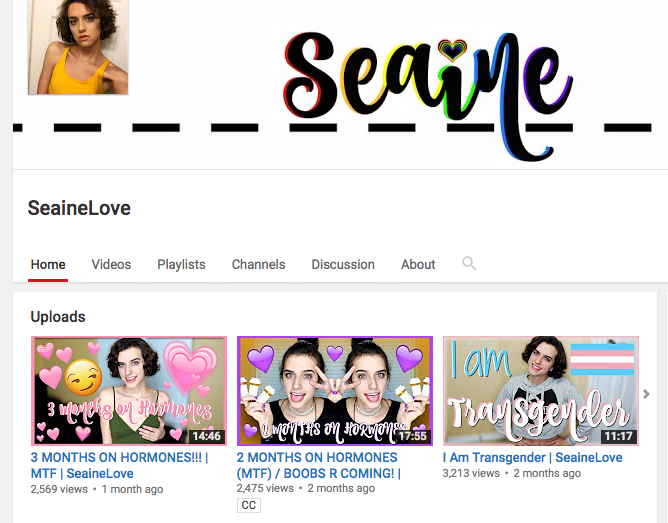 SeaineLove, a transgender YouTuber, said her recent videos chronicling her transition were removed. This is her channel in restricted mode vs. regular browsing. Several videos, including Teagan and Sara's music video and the wedding vows, are examples of "where we got it wrong," YouTube said. They're now viewable in restricted mode. Over the weekend, people bashed YouTube as discriminatory and hypocritical, using the hashtag #YouTubeIsOverParty, which was trending by Sunday night. #YouTubeIsOverParty🤔 So you care about censorship of gay people? Where were you when Milo got permanently banned from Twitter? Hypocritical. YouTube's parent company Google told BuzzFeed News that LGBT-related videos are still available in restricted mode, but "some videos that cover subjects like health, politics, and sexuality may not appear for users and institutions that choose to use this feature." Introduced in 2010, YouTube said "restricted mode" enables people and institutions (like schools and libraries) to more tightly control a users' experience. Flipping that switch can prevent LGBT youth from tapping into a community and deprive them of uplifting and instrumental content, many creators have argued. "While the system will never be 100 percent perfect, as we said up top, we must and will do a better job," the platform said. For stars like Tyler, the platform has been a way for typically disenfranchised people to connect and share their voices. "YouTube has always been a place for disenfranchised voices to reach audiences who are actively seeking representation in media," Tyler told Teen Vogue. "It's often the first place many LGBTQ+ youth around the world see themselves and their stories shared and celebrated."